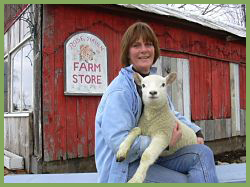 Rose Haven Farm, originally began as a small sheep farm operated in Langley, British Columbia, then moved to Ontario in 1994 to Grey County and then to Prince Edward County in 2001. Over the years the farm was an active sheep farm with various breeds ~ Romney, Rideau Arcott, Border Cheviots and later Texels and their crosses, as well as Angora Goats and two llamas. A value-added approach was common with lamb cuts sold at farmers markets and later through the Farm’s own shop. Fleece, rovings, batts and yarns as well as sheepskins were part of the operation, along with events such as our Shearing Day and Fibrefest. When the farm came to Prince Edward County, a Bed & Breakfast operation and a small shop on site were added as well as a rental cottage. After farming in the county for 6 years, I sold the farm and B & B to concentrate on the shop aspect of the business, easier to do as one gets older. I wish to thank all the terrific guests I had in the five years the B & B ran. Many of you sent me wonderful photos, small gifts and cards – you made me feel much appreciated that I was able to give many of you a genuine farm experience. I have lots of photos of guests and my fluffy friends. Rose Haven Farm Store grew in Picton and eventually moved to Main Street, the heart of Picton. The product lin e in the new store expanded initially to lamb meat cuts, fibre, sheepskins, handmade gifts and yarns. Gradually the shop expanded to become one of the premier yarn and fibre arts stores in Ontario. Our beautiful heritage building was warm and welcoming and over the 7 years we operated in Picton, the store became the main place in Eastern Canada to buy specialty products like Habu Textiles,Tilli Tomas, Artyarns, Fiesta, Mango Moon, Be Sweet and many other interesting and quality yarn products. We also expanded our offerings to include fine merino rovings, a variety of breed specific rovings, silks, books and embellishments. Rose Haven became a major go-to shop for visitors from many places. The shop was also complemented with our workshop approach. Initially we had Maureen Harding of Dreamspin teach nuno felting and Peter Trudeau illustrate how to sculpt with a felting needle. Later we offer more advanced and specialized felting workshops with Maggie Glossop, Barbara Poole and Marjolein Dallinga. In knitting and weaving we even and Takako Ueki, the owner of Habu Textiles give a workshop and fashion show. In addition several of us who worked in the shop: Diane Torney, Lynn MacCallum, Erika Mohssen-Beyk and Michelle Lambton offered various knitting, crochet and felting classes. For a while it was hard to let go of the farm in me so in 2007, I bought 10 acres on Closson Road, en route to several well known wineries in the county: The Grange & Closson Chase. The site was very plain but came with a large barn sorely in need of repair. I did repair the barn and worked with Ducks Unlimited to put in a pond system for wildlife. But later realized the shop took too much attention and that this would not evolve into my horticulture project and so sold the property.